As they say, marriages are made in heaven, but to make them legal, the couple who have tied the knot in a traditional manner should get into a legal contract or marriage contract. Contract Forms is very necessary as it is short of a declaration that contains all the relevant information about the couples. Given below are a few marriage contract samples that should go through to get an idea of how marriage contracts should be created. 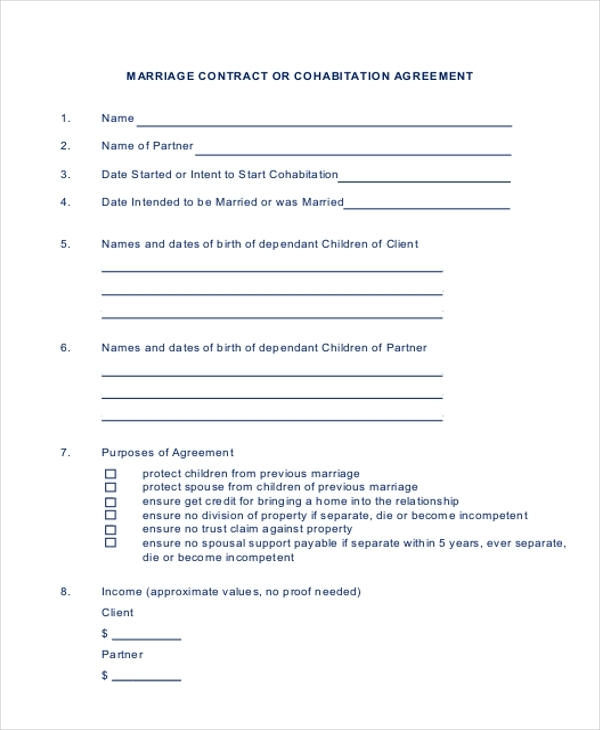 This is a simple marriage contract form sample that you can easily download and use for the purpose of making your marriage contract. It has blank spaces to be filled, and you can use it right away. 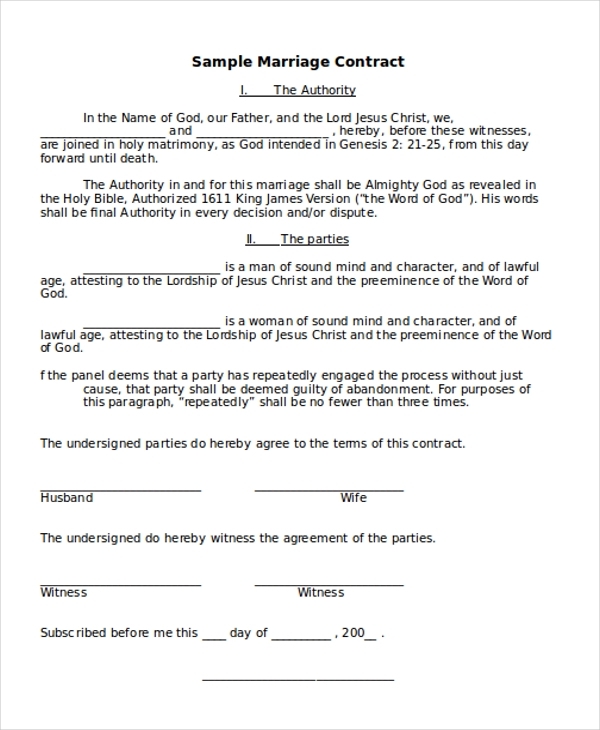 You may also see Nanny Contract Forms. 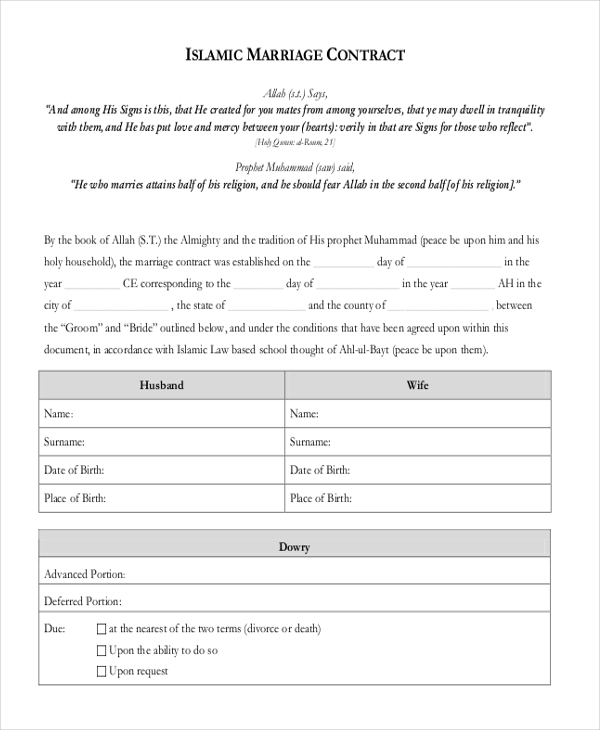 This sample form is specially created for the purpose of setting up a marriage contract for those who belong to the Muslim community. 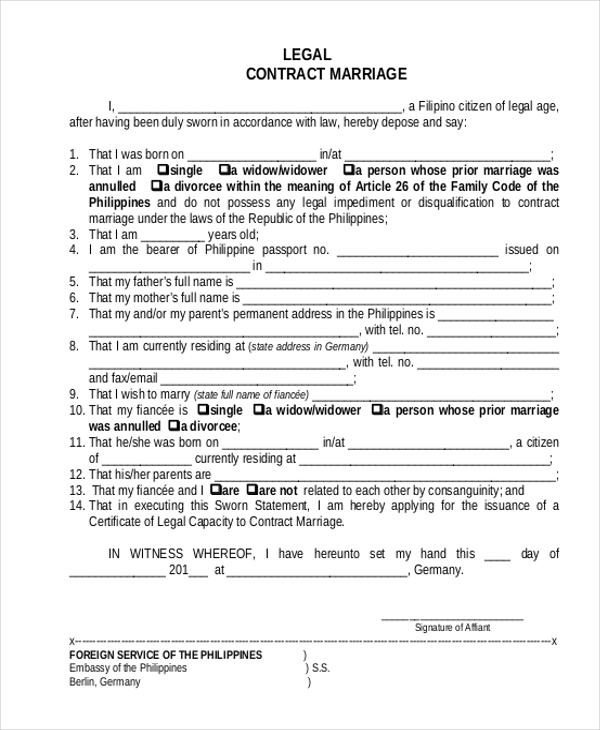 This form contains all the required terms and condition of an ideal marriage contract form. This is a detailed form that contains all the relevant information related to marriage. Different available in the contract can be applicable if any problem arises in future. All the religious norms and actions are also included in this sample form. You may also see Contractor Contract Forms. 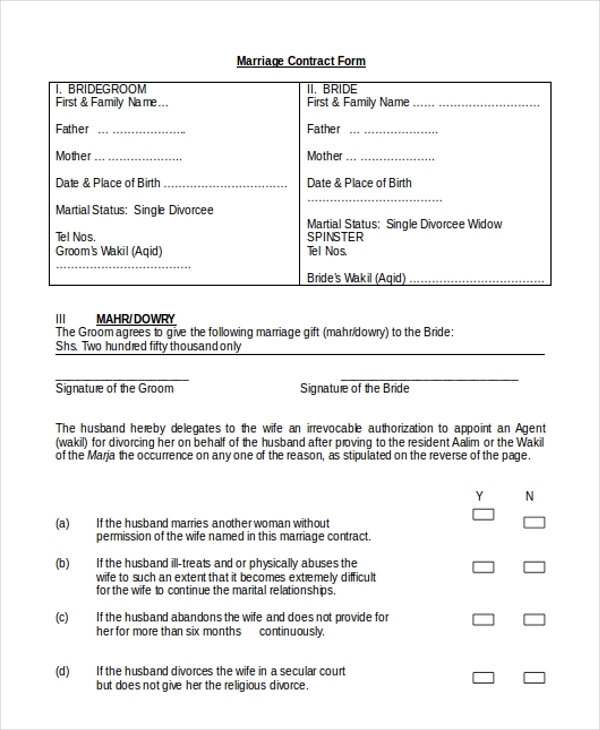 Blank Marriage Contract form is a form is a print-ready form that can be used for the purpose of creating a marriage contract. You just need to fill in the required information and print it out for your uses. Marriage Contract Cohabitation Agreement is meant for those people who intend to live together, and they are not married legally. It contains all the terms and conditions. It covers all the major details of the partners and also the agreement date has to be mentioned. Muslim Marriage Contract is a marriage contract that is made on the grounds of the 1874 Islamic Marriage Contract. Like any other marriage contract, all the terms and conditions of the marriage agreement. Legal Contract Marriage is a marriage contract wherein the couple who get into the contract signs an agreement together for the contract marriage. The term of the contract must be mentioned in the document. You can also see Car Sale Contract Forms. 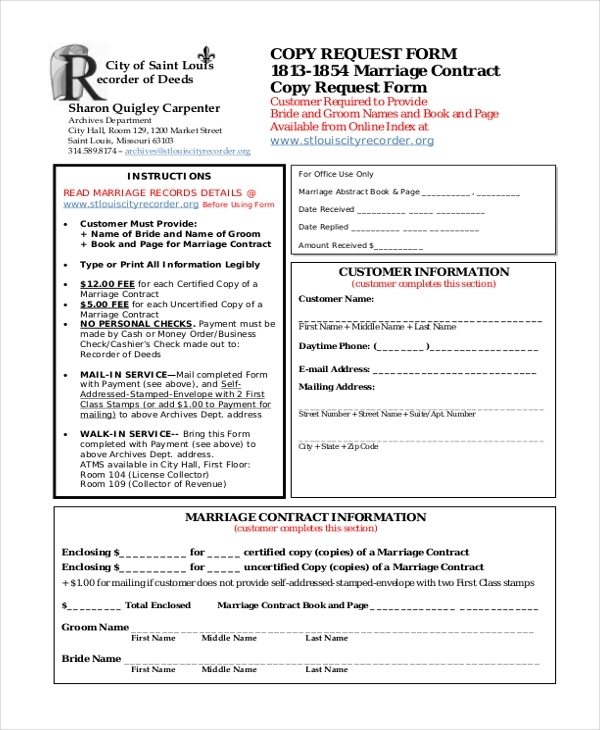 Marriage Contract Copy Request Form can be used by a married couple when they need to request a copy of their marriage contract. They need to provide all the details like their names, marriage date in the form. Why Do You Need To Have a Marriage Contract? Many people are of the opinion that marriage is a purely personal issue, but there are social and economic issues attached to it. For staying away from such legal matters, these forms are needed. It is short of a form that warrants a marriage to be a successful one. And these documents can be used if any dispute arises in future. In particular cases, after getting into a contract, the partner realize the issues of not being compatible with each other. In such cases, a written document in the form of a marriage contract assists them in taking the necessary actions. Also, marriage contracts also highlight the responsibility of each person in the contract. You may also see Purchase Contract Forms. What Details Should Be Included In A Marriage Contract? The objective to have a marriage contract is to reduce conflicts and make a reasonable understanding of the demands of people who are in the contract. This contract also includes the estate and asset management plans also. If the respective parents of the couple lay stress on the religious matters, they also need to be included in the contract. The most important part of the agreement is the emotional attachment and the love and care the partners have for each other and how they agree to shoulder each responsibility together in their married life. We have a vast collection of form samples in our kitty. You can go through them and select the one that matches with your requirement perfectly. This form is editable. Hence, once you download the, you can further make changes in them as per your need. You can also see Event Contract Forms.